"A Collegiate Game of Base-Ball"
Illustrated by Willard Poinsette Snyder, better known as W.P. Snyder, the image has been reproduced numerous times. But while the picture is a favorite of many baseball fans and historians (including myself), it has apparently never been researched to any extent. It should be noted that “amateur” did not mean that the players in the league weren’t talented athletes. Many were college athletes who could not accept remuneration lest they lose their amateur status. 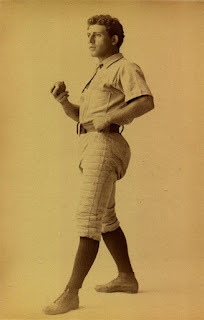 For example, the Orange Athletic Club featured a Yale pitcher named Amos Alonzo Stagg. Yes, the very same Amos Alonzo Stagg whose versatile and stellar career as both an athlete and a coach led him to enshrinement in the College Football Hall of Fame (both as a player and a coach) and the Basketball Hall of Fame. By the way, he also coached baseball at the University of Chicago for 19 years. is having a great battle for the championship, and the last game of the season will probably be played before a decision is reached. The two Staten Island clubs are having a contest for supremacy which is close and exciting, and as yet the winner is doubtful. That amateurs can play base-ball well was clearly shown when the two clubs met in a well-played game a short time ago. The day was clear and cool, and each man of the opposing nines was fit to do battle for his life. The grand stand was well crowded with people, and the cool bright dresses of the pretty girls, mingled with the light costumes of the cricket and tennis players, who had stopped their own play to watch the game, and here and there a bright blazer, and again dresses of a more sombre hue, all added to the beauty of the scene. Friends greeted friends as rivals on the ball field, and the merits of the players were discussed by both young men and maidens in a knowing way. For three hours the two nines struggled for supremacy, and when dark came neither side had been able to secure a run. The players fought well, and although neither team gained a victory, all had the satisfaction of knowing that they had taken in part in one of the best games of base-ball on record, amateur or professional. This is the only paragraph in the article in which a particular game is discussed, and with Sawyer’s detailed descriptions of “the pretty girls,” the “blazers” and “dresses,” and the “beauty of the scene,” it seems safe to assume that Snyder’s woodcut was intended to depict this all-Staten Island contest. 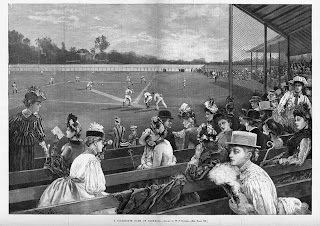 As such, it becomes clear that the word “Collegiate” in the title of the illustration was not meant to suggest that the scene portrayed a college baseball game, but rather a “collegial” match between amateur clubs. 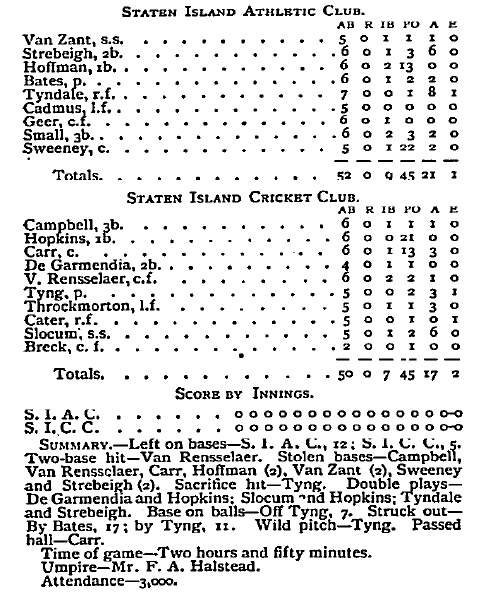 This particular baseball game between “the two Staten Island clubs” took place on July 20, 1889, with the Staten Island Cricket Club (SICC) hosting the Staten Island Athletic Club (SIAC). 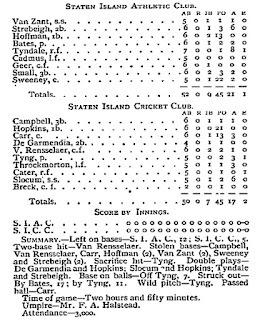 The most noteworthy event in the amateur arena up to August 1 was the remarkable game played at West New Brighton, Staten Island, on July 20, between the nines of the Staten Island Athletic Club and the Staten Island Cricket Club. The former had held a winning lead from the beginning of the season in the Amateur League pennant race, and they were regarded as sure victors on this occasion. To the delight of the Cricketers, however, after a battle lasting fifteen innings, the game had to be called on account of darkness, and during the contest not a run was scored on either side. We append the full score of this remarkable game, as it ranks among the best ever played by amateur nines, if not the best on record. The 15-inning contest lasted just under three hours and both starting pitchers went the distance. Interestingly, both of these pitchers were Harvard men. James Alexander Tyng pitched for the SICC. A dozen years earlier, as a member of the Harvard nine, Tyng made his mark on the game by becoming the first player to wear a catcher’s mask. After making the switch to pitching, Tyng ultimately played a handful of games for the Boston and Philadelphia National League clubs. 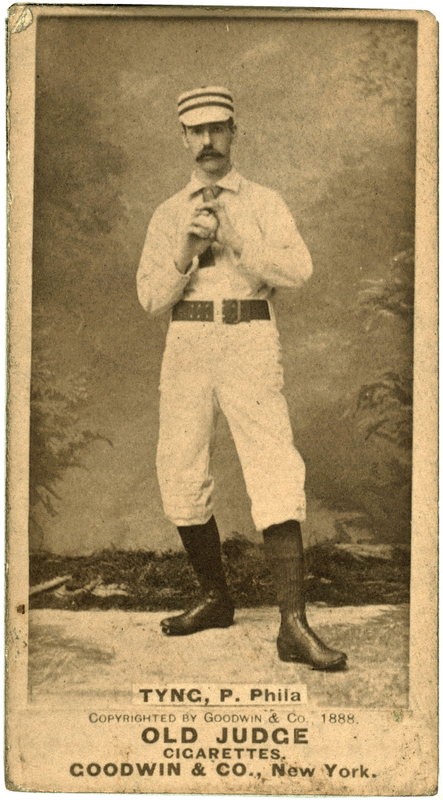 Pitching for SIAC club that day, Harry Wakefield Bates also twirled for Harvard, graduating in 1892. Additionally, Henry Warner Slocum Jr., a Yale alum who played shortstop for the SICC, was a stellar tennis player, winning back-to-back titles at the U.S. National Men’s Singles Championships in 1888 and 1889. He is enshrined in the International Tennis Hall of Fame at Newport, Rhode Island. 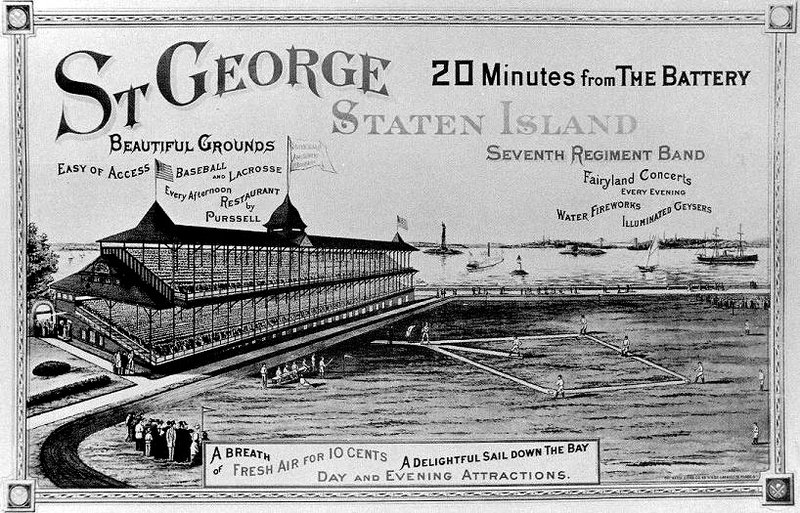 The All-Staten Island game took place at the grounds of the SICC, located between Bard and Davis Avenues, Delafield Place and Livingston Court in northeast Staten Island. The location is now called Walker Park and still serves as the home grounds of the club. 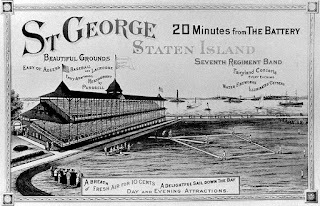 This park should not be confused with the more familiar St. George Grounds on Staten Island where the American Association New York Metropolitans played their home games in 1886 and 1887. As there are limited contemporary descriptions of the SICC grounds, it is difficult to determine how accurate Snyder’s representation of the July 20, 1889, scene might be. However, while it is known that the SICC grounds featured a grandstand, it seems unlikely that it was as substantial as that seen in the illustration. In fact, the grandstand pictured has more in common with one located over 3,400 miles east of Staten Island ... at Lord’s Cricket Ground in London! That is because Snyder’s illustration is clearly a “baseballized” version of the painting I saw back in 2010. It hangs in the Writing Room at the Marylebone Cricket Club (MCC) at Lord’s. 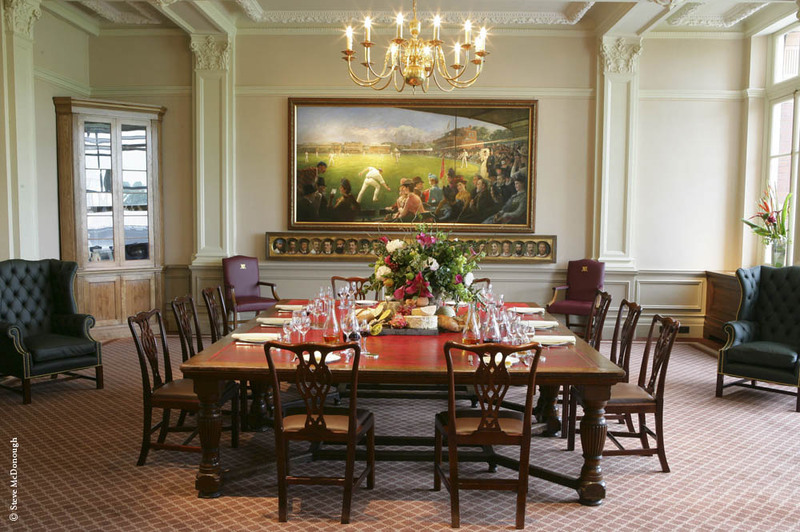 Painted by artists Sir Robert Ponsonby Staples and George Hamilton Barrable in 1887 to celebrate the 100th anniversary of the MCC, the approximately 5½ foot by 10 foot picture is known by several names. According to the MCC Museum, it is titled “Imaginary Cricket Match: England v. Australia.” But most contemporary sources referred to it as “An Ideal Cricket Match.” No matter the name, the painting depicts a fictional match between elevens from England and Australia, along with numerous spectators of note. The Englishmen are in. W. G. Grace and W.W. Read are at the wickets, and the former has hit one of Spofforth’s to the off. The ball having been saved at the boundary by Garrett, cover point, the batsmen are evidently in doubt about the practicability of a third run. The field has been carefully placed for the purposes of the picture by Spofforth himself, and while he has chosen the Australian team in conjunction with Scott and others, the English Eleven has been selected on the advice of Lord Harris, Messrs. V. E. Walker, L. D. Walker and other competent English judges. Half life sized portraits of the two elevens are introduced at the base of the picture in the pridella [sic], a method adopted by the early Italian Masters. The idea of the picture is due to Sir Coutts Lindsay, Bart., who proposes to hold a series of exhibitions in the chief capitals of Australia and New Zealand, for which purpose the ideal match has been painted. The artists, in a comprehensive view of Lord’s—giving full prominence, of course, to the pavilion—have introduced among the numerous spectators H.R.H. 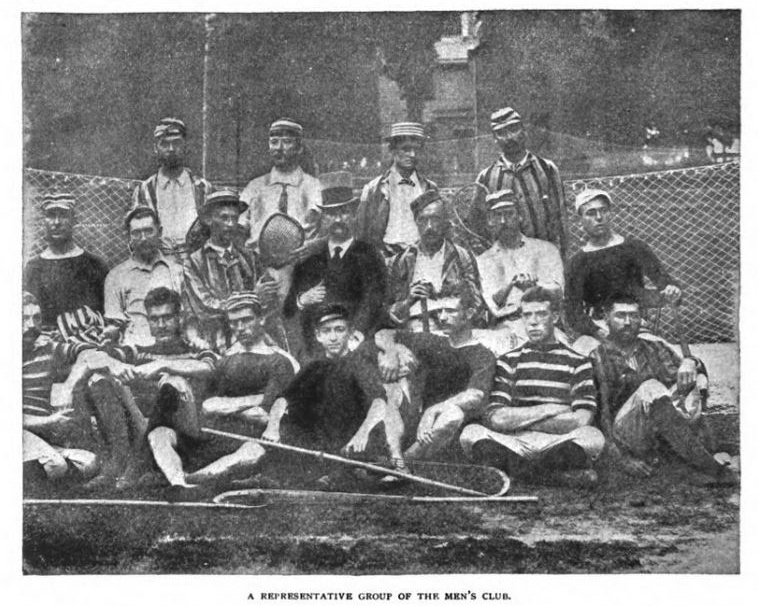 the Prince of Wales, with most of the principal representatives of the colonies in England, as well as a number of the chief notabilities of the cricket world, including the Earl of Bessborough, Sir Ponsonby Fane, treasurer of the Marylebone Club, Mr. V. E. Walker and others. The animation of the scene is increased by the charming toilettes of the ladies, among whom will be easily recognised some of our most popular English beauties. The picture is a graphic representation of our national game. The Prince and Princess of Wales (later King Edward VII and Queen Alexandra) can be seen standing on the field at far right, the Princess carrying a white parasol. W.G. Grace, arguably the greatest cricketer of all time, is the bearded batsman at the wicket, looking on as his ball heads to cover point and is about to be fielded by Australia’s T.W. Garrett. All told, well over five dozen individuals, both on the field and in the stands, are identifiable. A key to the painting is in the collection at the MCC Museum. Just when and how Snyder came to see the painting is a mystery. As noted in the story above, it originally toured Australia and New Zealand. Its whereabouts afterwards are a bit cloudy, but it was not until 1927 that the painting came to reside at the MCC. 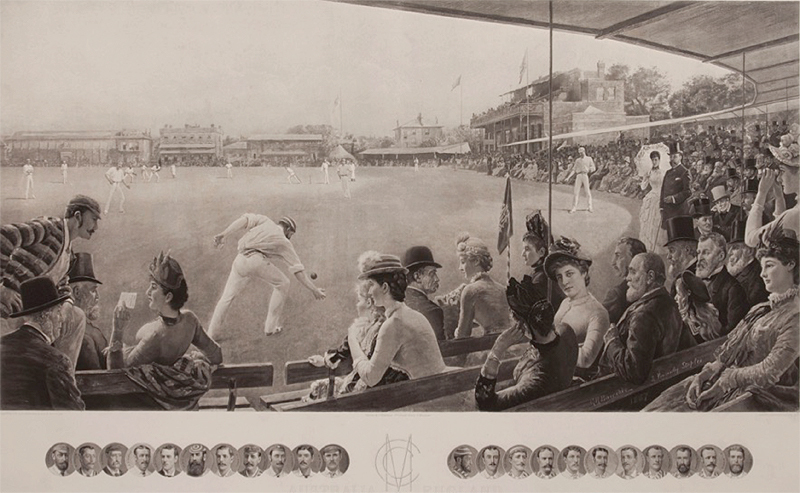 However, as a photogravure of the painting was produced by the international art dealer Goupil & Cie as early as March of 1887 (perhaps earlier), it seems likely that it was this version (titled simply "Australia v. England) that acted as the model for Snyder's work. Clearly there are major differences between the Staples-Barrable painting and Snyder's illustration. Most significantly, Snyder has replaced the cricket pitch with a baseball diamond, he has eliminated Lord’s original pavilion (the large brick building seen at right), and he has removed the various buildings and stands in the background. 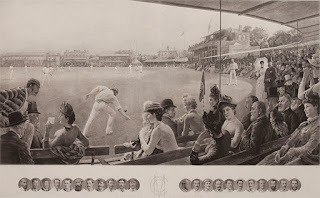 However, the crowd in the foreground still contains many of the same individuals as seen in the cricket painting. For example, in the original painting the woman at left who holds a note in her hand is Constance Gwladys Robinson, also known as Lady de Grey, close friend of the celebrated Australian opera singer Nellie Melba and the famous Irish writer Oscar Wilde. She is essentially identical to the woman in the Harper’s Weekly woodcut, though Snyder has added a pen to her hand, suggesting that perhaps she was keeping score. Of the dozen or so individuals who appear in both pictures, my favorite is the especially conspicuous woman wearing a yellow dress and red bonnet. Note that her attentions are far from the field of play, as she is practically facing the opposite direction. This woman is none other than Lillie Langtry, the celebrated beauty who went on to a successful career in the theater. She also happened to have had a three-year affair with Prince Albert ... the very top-hatted prince seen above and to the right of her in the Staples-Barrable painting. Perhaps she is deliberately looking away from him. Understandable, and yet it's too bad, because in either picture, she’s missing a heck of a ball game. Ok, this was awesome to read through. One of your best researched pictures. Great work!